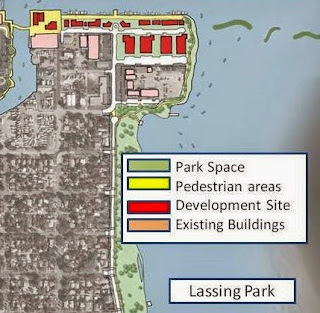 Downtown Waterfront Plan - Parks or Development which is it? 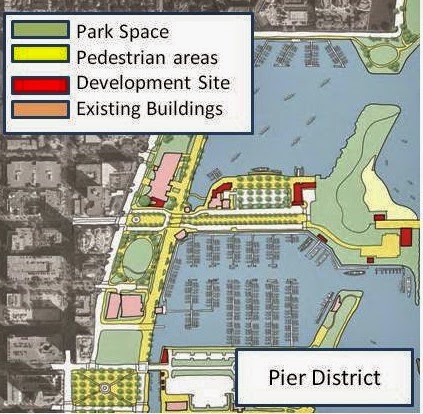 Almost no one is faulting the Downtown Waterfront Master Plan (DWMP) for its approach, level of effort or the care with which it was put together. The committee, the public and the consultant did a good job. It just looks like the City staff may have hijacked the final report. 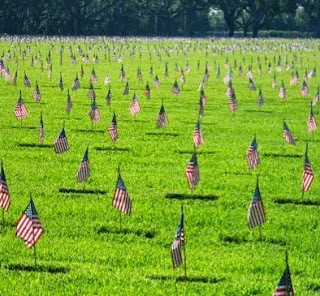 In fact, it is just the level of attention to detail that has allowed the public to become quickly aware of the large amount of proposed development included in the plan. In the Public Survey, respondents were asked to rate the benefits of the Downtown Waterfront. Nowhere in that list is any indication that significant commercial development is a benefit to the downtown waterfront. The DWMP includes almost 60 areas designated as "Development Opportunity Sites". 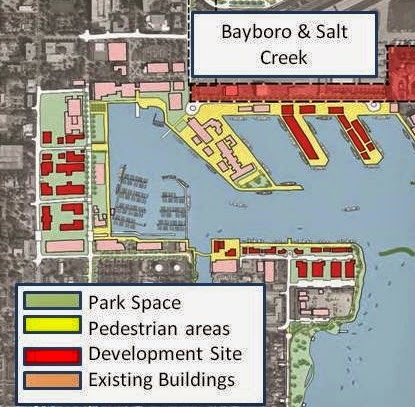 40 Development Opportunity Sites including 2 large new docks in the basin. Although it is hard to get a true read, it seems that the "Development Opportunity Site" portion of the plan was not aggressively in play during the public input. If that statement is not true will someone please show me where the public had a chance to weigh in on the development opportunity site part of the plan? The point is five years from now when a developer comes along and wants to develop a commercial asset, that may or may not be all that desirable, on waterfront property designated as a "Development Opportunity Site" it is going to be difficult to say no when the developer holds up the DWMP and says, "I am just doing what you said you wanted to do." For now all or almost all of the "Development Opportunity Sites" should be removed the DWMP and renamed to their current actual use. 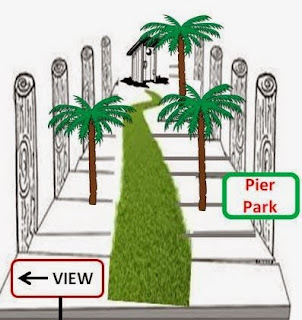 Nothing in that approach prevents a developer from requesting waterfront property for a development, but it does not provide a plan adopted by Ordinance to back up his request. The DWMP was conceived to protect the waterfront not provide a path to exploit it. The Rays attendance problem continues to worsen. They are now last in league attendance with even the usually high draw games seriously lacking. As I have often quoted Bud Selig, "St. Petersburg is not a major league baseball market." It remains unclear to me why it is so difficult for the politicians to accept the fact Selig was right. The Kriseman administration has put together another version of the now famous Memorandum of Understanding (MOU) which addresses the development rights issue that seemed to be the reason the last MOU went down the toilet. Payout money for an early move was also a big issue. Kriseman has been playing it a bit coy with Council saying he does not want to bring his latest MOU forward until he has enough committed votes for it to pass. Not exactly the way a representative government works. What he is really saying is he does not want another embarrassing discussion where he gets a bunch of questions he does not want to answer. Kriseman has refused to conduct the economic impact study Council member Kornell asked for the major reason likely being the only really serious economic benefit has probably been for Fergs Sports Bar. It's time for a Mayor and the City Council to just fess up to the fact major league baseball will not work here. Selig was right. For now, if the money portion of the MOU is still the issue with Council, how about a counter to the Mayor's most recent "offer": Rays give up all development rights, construction can begin any time, City agrees to keep 1,500 parking spots on the site, payout to move is set at $50 Million this year, reduces $4 million every year with the payout portion of the MOU sun setting in 2026. It is time to let the Rays look any where they want because unless there is someone in Tampa with a big ego and really deep pockets I don't think there will be a Tampa stadium deal. With two major league sports teams in Tampa, rising ticket and concession prices and the history of baseball in the bay area, it is hard to imagine a new stadium will simply make all of that go away. In what seemed to me a heartfelt attempt to get to an acceptable Downtown Water Front Master Plan City Council labored until they just couldn't go any longer Thursday night. At question was the inclusion of hotel/convention center and a host of areas all along the water front designated as "Development Areas"
The Hotel Conference center seemed to be a no brainer, with consensus it should be pulled from the Master Plan but the rest of the development parcels designated in the plan became much more difficult to deal with. At one point there was a suggestion that all of the development areas be pulled from the Plan but that seemed too draconian to the Council. What struck me was the tenacity that the Consultant and the Kriseman administration held onto the development portion of the plan. Struggling to keep the possibility of a Plan with massive "development opportunities" alive, both the Consultant and the Administration spoke repeatedly in glowing terms of the hotel/convention center, retail along the west side of Al Lange and other possibly wonderful commercial ideas that might evolve. Council, concerned that future Administration's or Councils might not interpret the plan as they see it, struggled to make changes that would clarify the intent of the plan only to be rebuffed by the Administration's team. In the end the Council continued the discussion to the next City Council meeting with instructions to staff that removed the hotel/conference center, took the "Development Areas" out of the South Basin and provided some additional language changes. The administration will bring back a modified plan. If all of the Council recommended changes are actually made there will still be a lot to be concerned about in the DWMP. Far to many undefined "Development Areas" remain; the approach to Bayboro Harbor seems completely impractical to name a couple. The administration harped on the fact that the plan is "conceptual" but defined areas highlighted in red "Development Areas" are a bit more than conceptual. 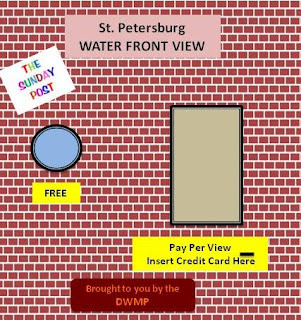 Even in it's revised form the DWMP is likely to be the biggest threat to the Waterfront ever approved by a City Council. This past week it looked like a window for more Pinellas County funding for the Arts may be opening. Creative Pinellas, the county-funded arts agency, is seeking $300,000 a year to promote the arts and to fund local artists and programs for the next three years. You can read more in Steven Girardi article in the St. Pete Tribune Pinellas leaders see value of arts, seek more information. County funding for the arts dried up when the County Office of Cultural Affairs was shuttered five years ago in the midst of the financial downturn. This is the moment when the arts community should be fully prepared with a program and details. County Commissioners want to know where and how any funding increase will be spent. Publically funded arts programs have a tendency to become cliquish. A broadly based program and accountability for how public art funds are actually spent is a necessity. 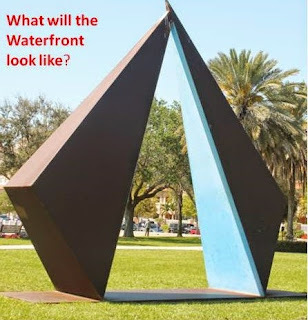 The $300,000 is a reasonable sum if Creative Pinellas can produce a plan with sufficient detail to make Commissioners feel comfortable. Beginning with a modest working budget line item in the new budget, the arts community should be encouraged to return in the next budget cycle to report on their success and the County Commission should be open to additional funding. The County Commission should avoid throwing a ton of money at the Arts only to be disappointed when the outcomes don't meet expectations or controversy arises over the program. 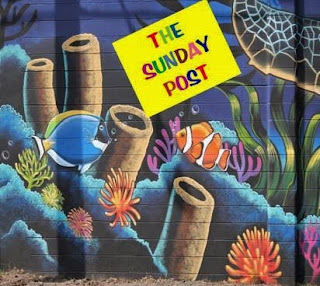 In St.Pete they have begun to realize throwing money at arts programs and using public funds to support individual artist or groups of artists does not produce a sustainable arts community. The St. Petersburg approach to the arts community is one the County should consider. St. Petersburg is moving toward a sustainability model which brings customers to buy local art to support its growing arts community. You can read about the Saint Petersburg approach in my six Post series A Casual Conversation with Wayne Atherholt St. Petersburg's Director of Cultural Affairs . For now it looks like the County Commission is poised to renew its commitment to the arts and they should. The Arts community should also realize that what comes from the public trough can just as easily disappear as it did 5 years ago. Moving from subsidy to sustainability is a model the arts community should embrace. St. Pete's Waterfront Master Plan...... "It's Like Hitting the Lotto" ..... Take a look at the Pictures and note the areas flagged as "Development" sites. St. Petersburg's New Waterfront Master Plan and the Ordinance adopting it was up for first reading at last Thursdays City Council meeting. 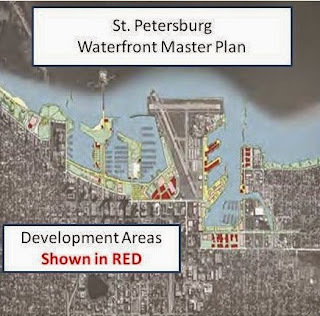 The St. Petersburg Waterfront Master plan is exquisitely done. It details the process, the participants, the stake holders, the objectives and the plan. You can see the whole plan at Downtown Waterfront Development Plan . You can read more in the St. Petersburg Tribune, Steven Girardi, New pier is start of big changes for downtown St. Petersburg’s waterfront. Steinocher's reference is not without merit, problem is the LOTTO winners will not be the citizens of St. Petersburg. The winners will be the developers who will use the Waterfront Plan to get access to property that normally would be out of their reach. Why such enthusiasm by the CEO of the Chamber of Commerce? If you read carefully the plan would be more accurately titled the "St. Petersburg Downtown Waterfront Redevelopment Plan. 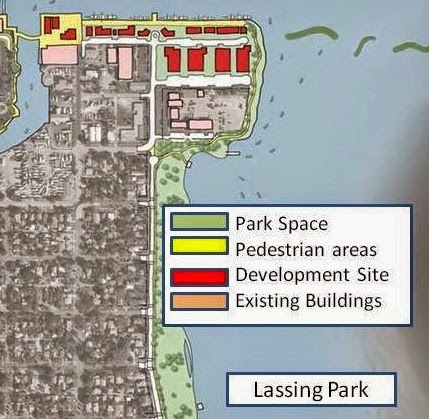 Neatly tucked into this plan is the proposed commercial development of a significant part of the water front. Take a look at the Pictures and note the areas flagged as "Development" sites. 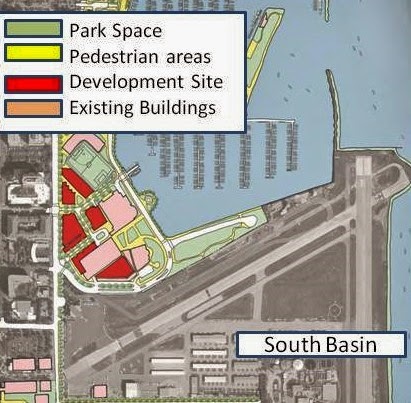 There will be a lot made of the fact this is just a "Plan" and it all requires approval but the problem is the "Plan" will be trotted out as justification every time some developer wants build on what is now protected waterfront. All of this should be enough to send you screaming to the Waterfront Charter Amendment Web site to get a Petition sign it and mail it in. for job creating economic development to support the recreational marine industry, scientific research, education, transportation, and cultural tourism." · Leverage USFSP and other Innovation District institutions to improve K-12 opportunities. A couple of the bullet points don't quite seem to fit the "small business" profile. As I said above this is an exceptional plan. And the plan is needed. It's just like most of what happens when the waterfront is the issue, good intentions and hard work of volunteers is quietly hijacked by special interests. As we have seen twice with the Pier, the public cannot trust the Administration or City Council to look after their interests on the water front. This Referendum puts you in the driver's seat. There will be a lot of bleating about how this Charter Amendment will stifle growth and make things too complicated. My answer is that's simply not true. What it will do is force developers to produce projects that will meet with public approval and that is a good thing. As indicated in the above Post there is a lot more to come. 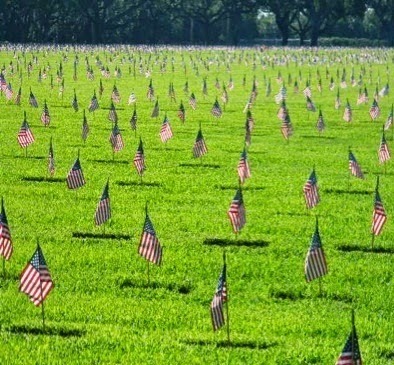 But there are a couple of lessons for City Council and perhaps an administration to learn. First and foremost several have asked the question; "How did City Council find themselves in this mess where they had limited options?" Once the Kriseman Administration put forth the process in Title XIX Chapter 287.055 and Council agreed to letting the Administration set up the selection committee the die was cast. The head of the committee was preset by the Statute and the outcome was almost completely assured, the inverted pyramid was coming down. Mike Connors was going to run the show and everyone knew or should have known where he stands and Connors usually gets his way. When things started going south, his Selection Committee rant move the members back in line and while the Administration didn't get ALMA they may get to tear the pyramid down which is satisfaction enough. Without adding in some caveats, Council essentially delegated the Pier selection process to a committee that was handpicked the Mayor, with a chairman with the administration's agenda and a good possibility of producing the desired result. "Why didn't City Council listen to the public?" The public survey was always a big risk. From the start the only way the public was going to be heard was if they agreed with the Administration. Taking both City Council and the public out of play with the formal selection process was brilliant. The lingering problem is both the Kriseman administration and the City Council are now saddled with at least a segment, and perhaps a growing segment, of the citizenry who thinks they are being deliberately ignored. And they are. As much as I and others exhorted Council to make a different decision, City Attorney John Wolfe summed it all up in what most of us knew, the possibility of legal action which would be costly and lengthy and far too big a risk. With the exception of Newton, no one was really ready to take that risk. Council took the only "legal action" they could. Their hands were tied. Here is where I think the City Council got taken for a ride. The Statute seems to leave the structure of the evaluation process up to the Agency, in this case the City. City Council should have retained the final ranking process as their purview and not delegated it to a group of 5 non-elected people and one biased staff member. However, given the seemingly aggressive redevelopment nature of the Waterfront Master Plan, this is a lesson that should not be missed. For now we wait and see what the outcome of the referendum effort will be. Given the ease with which it was possible for an administration to create a process that took both the City Council and the public completely out of the final decision making process for water front assets, this referendum takes on a whole new level of importance. There is a lot going on in most City Council meetings that is important. I have frequently noticed council members tapping a way on their cell phones as deliberations go on, the public speaks, etc. Phil Ammann Oh, I wish people would stop picking on Newt. He definitely can liven up a room. Janelle Irwin And he's got a heart of gold. I love the dude, but he's an easy target, sadly. Janelle Irwin King of gaffes, perhaps? Phil Ammann He will be in good company. Kate Bradshaw He's not afraid to chew people out. Amy Elizabeth Foster It's not disrespect-its frustration that he refuses to attend committee meetings where all our decisions are made and background is provided. He also doesn't read the backup material so we waste tons of your tax payer dollars b/c he isn't carrying his weight and it drags on meetings. It's also sad bc he makes points sometimes that should be listened to but people tune him out bc he starts with the same juvenile data no matter what the topic is. There I said it. Most interesting is the last Post. City Council members are supposed to turn all posts and tweets into e-mails and save them for public records purposes. I am making a public records request for this one. I'll let you know if one shows up. The point is this, while this one may be a bit questionable as to its appropriateness it also begs the question of people getting information from and/or supplying information to City council member's during meetings which is neither in the public view or available as a public record. Kind of moves a social media cloud over the meetings in the sunshine concept. 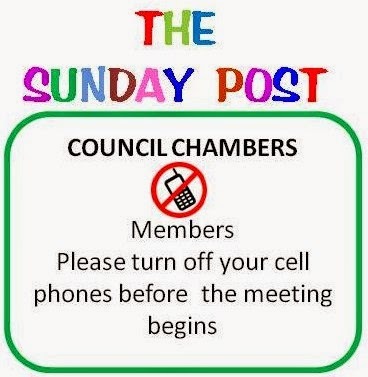 I also find it exceedingly disrespectful as council members tweet and post away on their cell phones as members of the public, who often struggle with getting up and speaking, find themselves being technologically ignored. All of this adds a great deal of credibility to the ongoing discussion regarding how much these elected officials really care about what the public thinks. 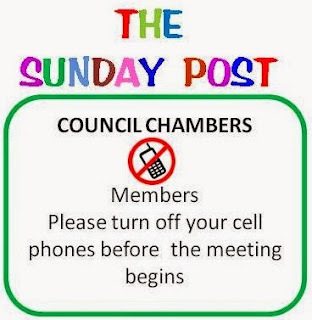 It is time for Council to agree to a cell phone free zone on the Dias, and for the Legal department to enforce the Tweet/Post to email requirement. Since some of our council members are not good at dealing with temptation, perhaps a secure lock box where the phones can be placed would be a good idea.